A SessionPilot is intended to make easier the use of a WorkSession. It receives commands, under alphanumeric form, then calls a library of Activators to interprete and run them. Then, WorkSession just records data required to work : Rules for Selection, Dispatch ... ; File Data (InterfaceModel and results of Evaluations and Transfer as required). SessionPilot records and works with alphanumeric commands and their results (under a very simple form). It calls a list of Activators to perform the actions. Thus, to a specific Norm or way of working, only Activators change. 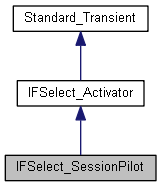 A specific Initialisation can be done by starting with a specific set of commands. Creates an empty SessionPilot, with a prompt which will be displayed on querying commands. If not precised (""), this prompt is set to "Test-XSTEP>". Returns the Command Line to be interpreted. Returns the part of the command line which begins at argument <numarg> between 0 and NbWords-1 (by default, all the line) Empty string if out of range. Processes specific commands, which are : x or exit for end of session ? or help for help messages xcommand to control command lines (Record Mode, List, Clear, File Output ...) xsource to execute a command file (no nesting allowed), in case of error, source is stopped and keyword recovers xstep is a simple prefix (useful in a wider environment, to avoid conflicts on command names) xset control commands which create items with names. Sets the Command then tries to execute it. Return value : same as for Perform. Executes the Commands, except that the command name (word 0) is aliased. The rest of the command line is unchanged If <alias> is empty, Executes with no change. Executes a Counter in a general way If <numword> is greater than count of command words, it counts all the model. Else it considers the word <numword> as the identifier of a Selection <mode> gives the mode of printing results, default is CountByItem. Returns the WorKlibrary (Null if not set). WorkLibrary is used to Read and Write Files, according to the Norm. Returns the count of recorded Commands. Interprets a string value as an entity number : if it gives an integer, returns its value else, considers it as ENtityLabel (preferably case sensitive) in case of failure, returns 0. Executes the Command, itself (for built-in commands, which have priority) or by using the list of Activators. The value returned is : RetVoid if nothing done (void command) RetDone if execution OK, RetEnd if END OF SESSION, RetError if command unknown or incorrect, RetFail if error on execution If execution is OK and RecordMode is set, this Command Line is recorded to the list (see below). Reads commands from a Script File, named <file>. By default (file = ""), reads from standard input with a prompt Else (reading from a file), the read commands are displayed onto standard output. Allows nested reads. Reading is stopped either by command x or exit, or by reaching end of file Return Value follows the rules of Do : RetEnd for normal end, RetFail if script could not be opened. Returns the Transient Object which was recorded with the current Line Command. If none was, returns a Null Handle. Allows to associate a Transient Value with the last execution as a partial result Returns RetDone if item is not Null, RetFail if item is Null Remark : it is nullified for each Perform. Returns the Record Mode for Commands. Default is False. Removes a word given its rank. Returns True if Done, False if <num> is out of range. Returns the WorkSession which is worked on. Sets a WorkSession to be worked on.